After eight years of work, Egypt has finished restoring a Christian monastery, considered the world's oldest. The Egyptian government is using the popular Coptic Christian pilgrimage site as a symbol of the country's willingness to peacefully coexist with its Christian minority, but after facing sectarian violence in January, Coptic Christians are even more wary of extremism and discrimination. In January, on the eve of the Orthodox celebration of Christmas, six Coptic Christians were gunned down outside a church in the Egyptian town of Nag Hamadi. In response, protests erupted in Coptic Christian communities from New York to Sydney. An increase in Islamic conservatism in Egypt in recent decades has resulted in greater discrimination and persecution of Egypt's Copts. The Egyptian government is presenting the restoration of St. Anthony's, believed to be 1600 years old, as a symbol of Egypt's respect for the variety of religions practiced within its borders. Egypt's chief archaeologist Zahi Hawass spoke at the monastery site, making it clear that Muslims did the restoration work on the ancient building. "The announcement we are making today shows to the world how we are keen to restore the monuments of our past, whether Coptic, Jewish or Muslim," Hawass said. The government-sponsored project took eight years and cost more than $14 million. 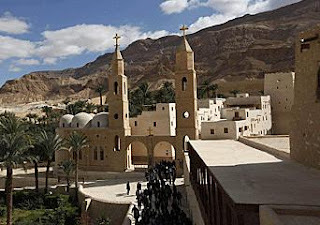 St. Anthony's is a popular Coptic pilgrimage destination. Mark is credited with bringing Christianity to Egypt in the First Century, and the Coptic Christians make up about 10 percent of Egypt's 82 million people. The Muslim majority, however, has control of the government, and religious freedom is not equal in Egypt. Children of all religions are taught the Koran in schools. Legally converting from Christianity to Islam is easy, but it can be close to impossible for a Muslim to change his religion to Christian on his national identification card. Egyptian President Hosni Mubarak came out after the Nag Hammadi attacks and insisted the violence against Christians did not represent the attitude of the government or of the country as a whole. According to the state-owned newspaper Al Ahram, Mubarak said, "We are one people. We are not fanatics because we are all children of this land, and there is no difference between Egyptian Muslims, Christians and Jews." At the least, Egypt doesn't want any excuse for foreign governments to come intervene in Egyptian affairs. Mohamed Shabba does blame the government. He wrote in the independent Nahdet Masr newspaper that Nag Hammadi "was not an individual act. It is a political, religious, social and above all a governmental crime…caused by the backwardness of education that is teeming with racism, extremism and contempt for the other. It is also an economic crime because it took place in Upper Egypt, the area that has suffered from government neglect for years." Father Metyas Mankarios in Cairo, who runs a newspaper for Coptic Christians, commented on the change in attitudes toward Christians in Egypt since he was a boy. "It's dangerous today. Egypt is going in new directions that are starting to affect the harmony between religions. This attitude is evident not only among ordinary Muslims but among top government and Islamic officials," he said. "When I was young, I didn't see all this tension coming," he said. "We got along with Muslims just fine. That's all changed." Awny Mikhail, a Copt jewelry store owner in Cairo, told The LA Times, "I don't want to see a chain reaction from the Nag Hammadi incident," he said. "The media will try to turn this into something more. Things aren't that bad. Muslims have become more conservative, yes, but I support the government in trying to stop Islamic extremism." Christians in Egypt may not be slaughtered every day, but Father Metyas Mankarios expressed the vulnerable situation the Copts face, saying,"The Egyptian government is not worried about Coptic unrest. We don't have militias or a political party. Copts are no threat to the government. All we can do is shout."